Is it time for a change after the Bulls eighth consecutive loss, this time 107-100 Tuesday to the Los Angeles Lakers? Perhaps a change of pace; certainly a change of heart. Because the Bulls clearly have to change their ways, which would be a welcome change. So Jabari Parker to the starting lineup? Never say never in this Bulls season. Especially since the previously banished Parker not only returned to the playing rotation in what Boylen said is not temporary, but Parker led six Bulls in double figures with 18 points on seven of 10 shooting. The recent outcast then inspired a group of Bulls irregulars to the team’s best run of the game in the last three minutes when the Bulls cut a 17-point deficit to five and even denied the devastated home crowd free tacos with 19 points in the last 2:31. Just who these Bulls are remains a much larger question. Lauri Markkanen added 17 points, but it again was a struggle with tough shooting chances and six of 14 shooting. He was part of that starting group that was subbed out late before the team’s best play of the game. In that early third quarter stretch, actually one of two long droughts with the second early in the fourth quarter, Boylen took out Kris Dunn, apparently for passing on open shots. Dunn had a brutal game with a team high minus-25 plus minus with six points. Ryan Arcidiacono had 12 points and a team best plus-17 with Chandler Hutchison also scoring 12 points. Shaquille Harrison and Zach LaVine each had 10 points and LaVine had a team high eight assists. There wasn’t enough done by the Bulls, except for the usual good moments. Just not enough of them, also as usual. Hutchison was an early bright spot back home in Southern California with his second consecutive game scoring in double figures. Hutchison had just two such games previously all season. With Hutchison scoring in three consecutive possessions midway through the first quarter, the third on a slashing dunk on a Wendell Carter Jr. pass, the Bulls trailed 19-18 after the first quarter. The Lakers were again playing without the injured LeBron James and slumping, coming off a home loss to the Cavaliers and losers of seven of their last 10, including also to the Knicks at home. The jackals were eying the job of coach Luke Walton with another loss. But the Lakers went to 24-21 while the Bulls fell to 10-34 and second poorest record in the league. One guy who is having continued trouble figuring it out is Markkanen. 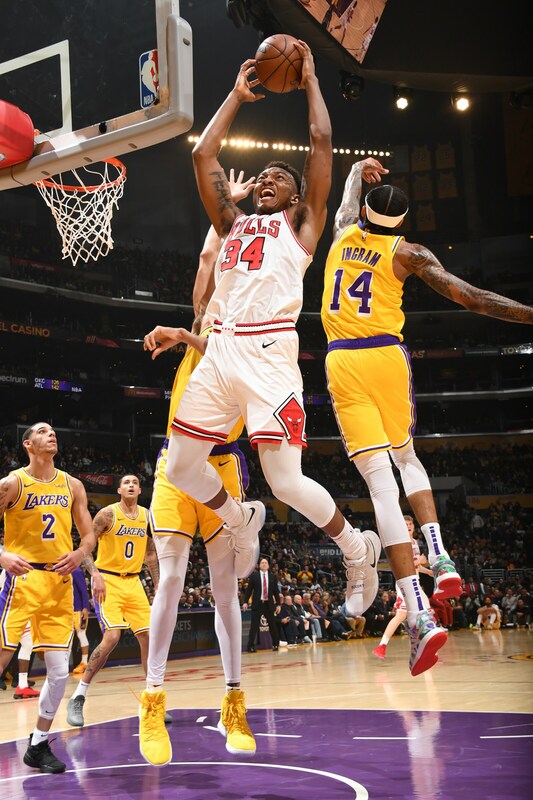 The seven footer who was a prodigy last season had a burst of life in the third quarter with a pair of driving scores and a tough jumper to get the Bulls within 66-62 after a run of Lonzo Ball scores enabled the Lakers to break from a 44-43 halftime lead. Ball scored 13 of his team high 19 points in the third quarter with three of four threes. Which is a hint you have problems when Lonzo Ball is outshooting Markkanen. “Just trying to go to the next game and fix this and go day by day,” Markkanen said evenly. “That’s the only way we can fix this, practice and work hard. It’s not fun to lose. It’s a part of it. We are just trying to get out of it as quickly as possible. The good part of the NBA is you play almost every night. Have a bad game, just restart and go back at it again. That’s what we have to do. Like, you know, Jabari Parker. Parker was effectively removed from the playing rotation after playing four minutes in the game in Mexico City. He didn’t play the next nine games even in blowouts, played 14 minutes against the Pacers Jan. 4, and then not again for three games until scoring 11 points in 19 minutes in the loss to Utah Saturday. Then before Tuesday’s game, Boylen said Parker was back in the playing rotation, and against the Lakers Parker was the best player on the floor for the Bulls with 18 points in 17 minutes with two of four threes and a pair of steals. It appears the 6-8 Parker is back to playing regularly again as he did earlier in the season as the major free agent signing of the summer; a trade still remains possible. Parker says he’s just glad to be back on the floor, though he said he never really was told why he wasn’t playing. But he said he’s again ready to move forward. That was apparent when he came into the game to open the second quarter and immediately made a driving slam dunk and a three pointer. Tuesday’s game got away from the Bulls after Parker was dominating the start of the fourth quarter. 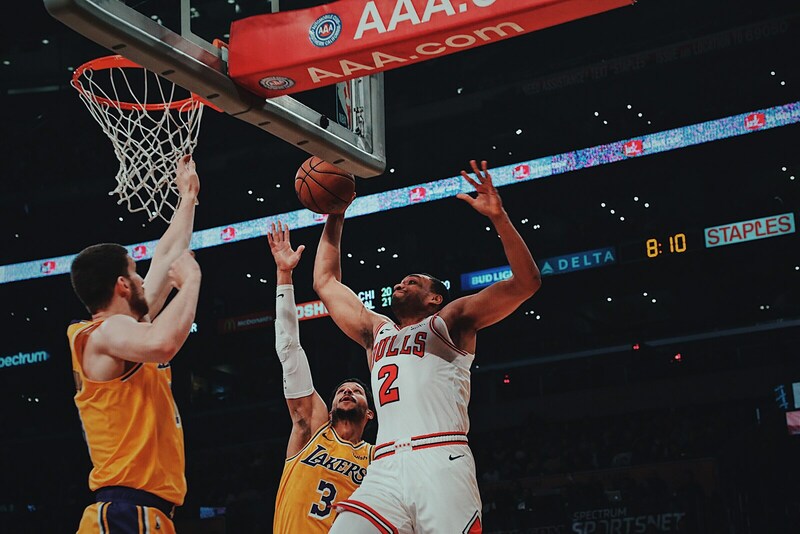 He was fouled and made a pair of free throws, hit Wayne Selden with a snappy pass on the run for a score and then picked up a loose ball between three Lakers for a slam dunk to bring the Bulls within 80-76 with 9:32 left. 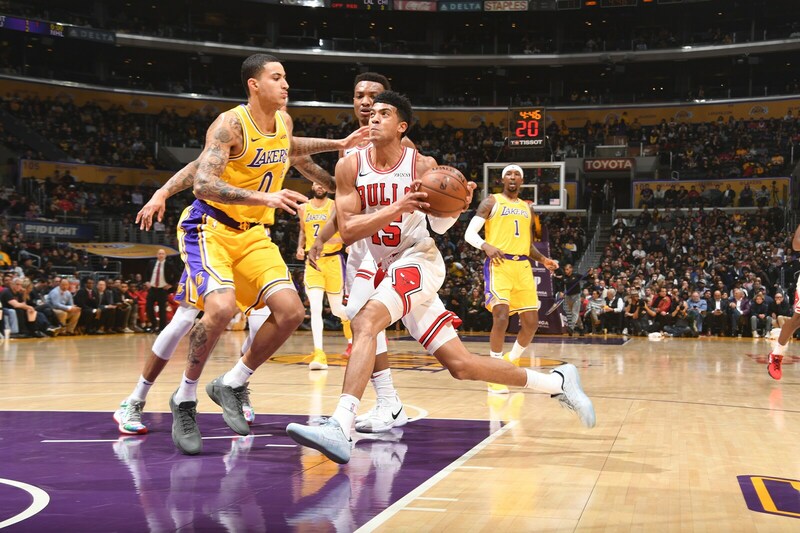 The Bulls then went five minutes without a point as the Lakers scored 14 straight for a 94-76 lead. That bench group with Parker scoring 11 fourth quarter points, Arcidiacono, Hutchison, Cristiano Felicio and Shaquille Harrison hustled their way back to at least forcing the Lakers to reinsert three starters in the last two minutes. The Lakers offer fans free tacos for winning and holding the opponent under 100 points. So the Bulls scored on nine straight possessions in the last 2:46 to get to 100, denying the fans who pay an average of $445 per seat those two tacos that go for 99 cents. Hey, it’s California. And it was raining. They were not happy. “Just communicate with me; that’s what the struggle has been so far,” said Parker. “I don’t know what’s going on. I (feel I) bring a lot of aspects to the game. I don’t bring just one dimension. I can play any position, so position is not the excuse. “But just to get my name called out there is a privilege,” Parker acknowldged. I’ll just say this, when you experience certain things and you see certain things happen to you, I think it’s rare for you to have those same type of feelings (you had before). It’s kind of hard, especially when people are indirect with you. But right now it’s just about me and what I can do to help this team. I’m focusing on my growth, how I can get better. Anybody in any situation if they have been dealt some bitterness, I don’t think it’s necessarily going to be the same, so that’s all I am going to say about that. “I know what I can do; I am the same guy,” said Parker. “Every time when I go out there it’s going to be the same thing, be solid, play smart and see how it goes. (For us now), it’s just stay with it, keep on trusting each other, keep on boosting each other’s confidence. That’s what’s going to help us. Play for one another, and just the things we have already. We just have to sharpen them and we’re going to do that. Time for the Bulls to start getting in the game as well and making it a change for the better.